"Heroes Among Us" is a free event that highlights resources available for Veterans and Active Duty Service Members, and their family members. Visitors will have the opportunity to meet with representatives from federal, state and nonprofit organizations. There will be informative talks, service dog demonstrations and a free yoga class! Visitors will also have the opportunity to take a "behind-the-scenes" tour of future galleries that showcase Marine Corps history from 1976 to 2015. 9:00 AM - 4:00 PM–Throughout the event, take overview tours of future Final Phase galleries to include escorted tours of the Changing Exhibits Gallery to see macro artifacts. 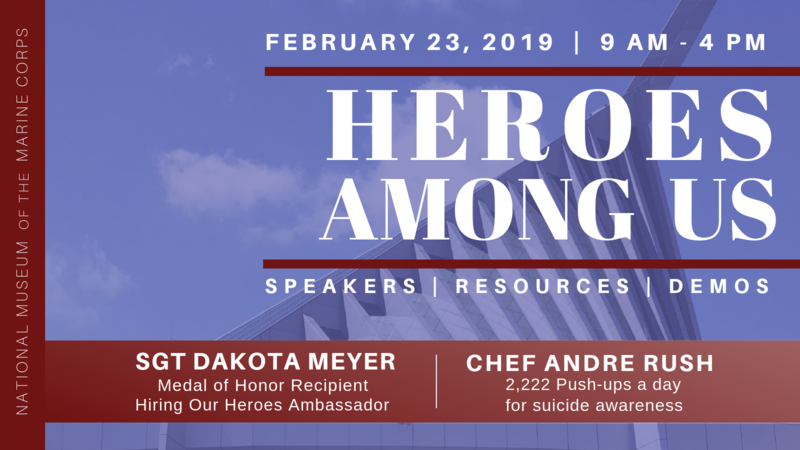 Speaking on behalf of Hiring Our Heroes, Sgt Dakota Meyer will be sharing with service members and veterans the importance of early preparation for military-to-civilian transition. SEATING IS LIMITED! RSVP REQUIRED : GET YOUR TICKET! 2,222 push-ups a day for suicide awareness! Join Chef Rush in Leatherneck Gallery and learn more about his efforts to bring about awareness of service member suicides. He will be challenging visitors to join him in his commitment to do 2,222 push-ups in a day! Find out more about Chef Rush! CAPT Buford's topic will include the history of service members' faith in battle and spiritual fitness. 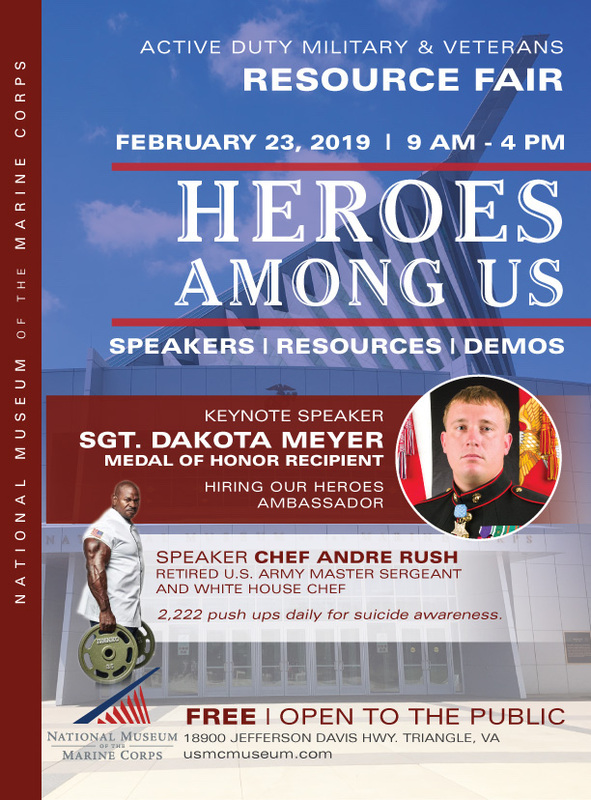 The Marine Corps Heritage Foundation will be offering a combo ticket special of $7 per person for the "WE, THE MARINES" film and the laser rifle range during the Heroes Among Us Event on Feb 23rd. The film will be playing at 10 am, 1 pm, 2 pm, 3 pm and 4 pm. Plan your day now! It's going to be epic! Join us on February 23, 2019! Admission to the Museum and parking are FREE. Questions? Contact us at USMCMuseum@gmail.com.